The last stand of an isolated detachment of the French Foreign Legion in Mexico came to represent the spirit of that illustrious unit. Their self-sacrifice epitomized the sense of duty and honour that superseded all other considerations, including survival, and symbolized the determined ethos of the Legion. The French military intervention in Mexico, subsequently known as the Franco-Mexican War, had been provoked by the Mexican government defaulting on interest repayments in July 1861. The fleets of Great Britain, Spain and France arrived at Veracruz soon after, with the intention of pressuring the republican government of Benito Juárez into submission. Though some Spanish troops had been dispatched, it was neither the intent of Britain nor Spain to launch a full military expedition. It was the arrival of the French army and their occupation of the eastern city of Campeche on 27 February 1862 that demonstrated the French were far more belligerent than their other European partners. Concerned that France intended to establish a permanent occupation, the British and Spanish withdrew their forces. Napoleon III, Emperor of the French, believed the situation in Mexico offered him a number of benefits. He was eager to demonstrate the military power of the French empire and thereby to establish a more favourable diplomatic position in Europe. He was also keen to re-establish good relations with the Austrian Habsburg empire after an inconclusive and costly war against them in 1859, as such diplomacy would be the means to link the crowned heads of Europe and suppress republican or revolutionary movements. Action against the secular republic of Mexico in favour of a Catholic restoration and a rapprochement with Austria would also please Napoleon’s Roman Catholic supporters at home. In April 1862, however, the Mexican government remained defiant, and a blockade of the Pacific port of Mazatlán failed to change the situation. Indeed, the check of a French force at the Battle of Puebla (5 May 1862), at the hands of the Mexican forces under General Ignacio Zaragoza, indicated the need for a stronger effort. The Mexican army was halted outside the city of Veracruz at Orizba on 14 June, and French reinforcements began to arrive in September (rising to a total of 38,400 troops by the end of the year). Through October, General Achille Bazaine repeatedly took the offensive, capturing Tampico, Tamaulipas and Xalapa, and then, after a bombardment on 15 January 1863, securing Veracruz. The next objective of the French expeditionary force was Puebla, and, in March 1863, General Élie Frédéric Forey was tasked to lay siege to the city. The Mexicans could muster a total of 80,000 men but most of these forces were dispersed in garrisons. It was still possible, however, to dispatch relatively small formations to harass the French and try to cut their lines of communications from the coast. The French besieging force at Puebla had requested stocks of food, ammunition and tools, as well as three million francs. These supplies had to be transported with a relatively small guard along an obvious route: factors that played into the Mexican army’s hands. The protection of the convoy was the responsibility of Captain Jean Danjou, who was assisted by Lieutenants Clément Maudet and Jean Vilain, and accompanied by 62 Legionnaires of the 3rd Company, Légion étrangère (French Foreign Legion). Danjou was a veteran with considerable military experience. He had served in Algeria where, during a close-quarter battle, his rifle had exploded and so damaged his hand that it had to be amputated. Despite the injury, Danjou went on to serve in the Crimean War at the Siege of Sebastopol, and then at the battles of Magenta and Solferino in northern Italy during the Franco-Austrian War (1859). When he received orders to assist in the protection of a supply column of carts and mules, he lost no time in assuming command of a small detachment of Legionnaires. Dressed in their characteristic blue jackets, baggy red pantaloons and white kepis, they each carried a rifled musket with its long bayonet and laboured under the weight of a heavy pack. The force was, as everyone later agreed, far too small for the task, but sickness had reduced the number of available troops and the dashing Danjou was forced to press the only men he had left into service. This small detachment had marched through the night to avoid the heat of the day, and at 0700 hours on 30 April, they halted to rest. Before they had even had the opportunity to brew coffee, several squadrons of Mexican cavalry appeared, and the Legionnaires had to scramble into a square formation – still the traditional way to resist attacks by horsemen despite the introduction of longer-range rifled weapons in the French army. The Mexican cavalry nevertheless believed that their superior numbers and the element of surprise gave them a distinct advantage and charged. For some time, the French Legionnaires held their position, inflicting a number of casualties on the Mexicans and driving off several spirited charges. Despite this, Danjou was aware that his position was too exposed and the densely packed ranks were too large a target. He therefore ordered that, while maintaining a loose square, the Legionnaires were to withdraw towards a hacienda near by. They did so, taking casualties along the way. Hacienda Camerone was a rough adobe-and-wood structure, but it possessed a 10-foot (3-m) high mud wall that would at least offer some protection against cavalry. Danjou’s aim was to hamper the Mexican cavalry long enough for the convoy to escape. While some of the Mexican cavalry dismounted to engage the French, Danjou had at least survived the initial onslaught. The French position was critical. 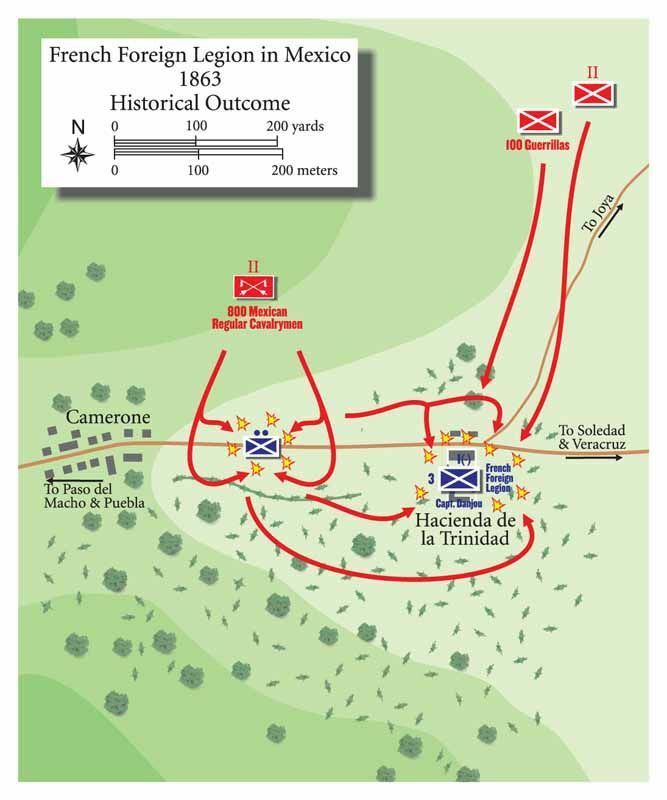 The Mexican cavalry had prevented Danjou entering the village of Camerone, and even the main structure of the hacienda had fallen into their hands. Confined to a compound around which stood some ruined outbuildings, the position was hardly tenable. Mexican sharpshooters accounted for some Legionnaires who were trying to cover the gaps in the walls, but the French did manage to beat off the rushes of dismounted troopers and the mounted charges. Colonel Francisco de Paula Milan, the commander of the Mexican cavalry, believed that the foreigners had no options left. He called on the French to surrender, but Danjou was still hoping to buy time and refused. It is alleged that the French captain also swore he would fight to the death and that his Legionnaires, inspired by this determination, expressed the same sentiment. Their situation began to change at 1100 hours when Milan’s reinforcements, a battalion of 1,200 infantrymen, arrived. The hacienda was soon encircled and fire began to pour in. Outnumbered twenty to one, the Legionnaires were exposed to the cruel heat of the sun, had no water, and had only the ammunition that each man carried in his pouches. For over an hour shots were exchanged, with casualties mounting steadily on both sides. The hacienda caught fire, the smoke and flames adding to the miseries of the dwindling garrison. By midday, half of the French force was either dead or wounded. Then, suddenly, Danjou himself was hit full in the chest. He died instantly. Under cover of fire, the Mexican infantry tried to edge forward, and for a further four hours the French detachment maintained their fusillade. It was a very one-sided affair. Vilain was killed towards the end of the afternoon, leaving Maudet and just 12 others to continue the resistance. Surrounded by the dead and dying, and wreathed in smoke by the smouldering ruins of the hacienda, this tiny force was unable to cover the entire perimeter. The Mexicans were now able to bring fire to bear on every part of the position, and at around 1700 hours, after a day of fighting, only Maudet and five Legionnaires remained. Thanks to the unquestionable heroism of Danjou and his men, the convoy did indeed make its way intact to the French forces besieging Puebla, and seventeen days later the city fell. General Bazaine defeated the Mexican relieving force at the Battle of San Lorenzo (8 May 1863) and then went on to enter Mexico City in June that year. The Mexican government fled to the north to continue its resistance from there, but more and more of the country fell under French control. On Napoleon III’s prompting, the Habsburg dynasty provided the new ruler, Emperor Maximilian I of Mexico, in April 1864. An Imperial Mexican army was created, with Austrian volunteers augmenting the new force. Republican Mexican resistance continued, however, into 1865, and the United States, emerging from four years of Civil War, demanded that the French occupation be brought to an end. Some 50,000 US troops assembled on the Rio Grande and, fearing a war with America, the French began to evacuate Mexico in February 1866. 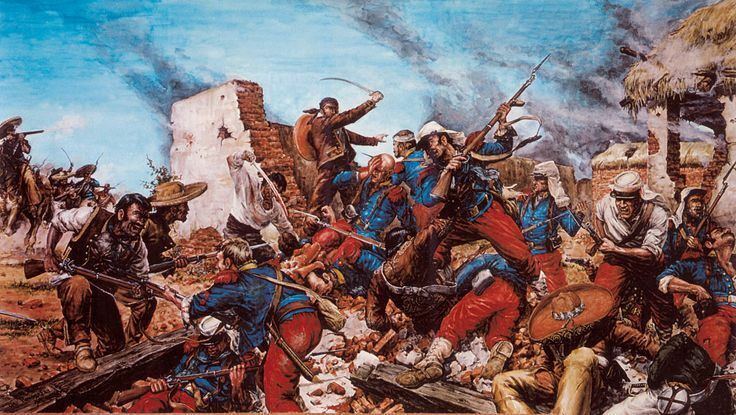 Maximilian’s forces were subsequently defeated by Mexican republicans in a series of battles until, in 1867, the capital fell back under the control of Juárez. Maximilian, accused of having ordered the execution of all rebels who opposed him, was shot by firing squad in June that year, and the republicans were restored to government. The French Foreign Legion, which had suffered the bulk of the casualties of the French expeditionary force in the war, was eager not to lose sight of the achievement of Danjou and his detachment at Camerone. Some time after the battle, Danjou’s prosthetic hand was found on the site of the fighting. He had worn the wooden limb painted as a glove, but somehow it must have been ripped from his body in the confusion of battle and been left behind. It was restored to the Legion some years later and on Camerone Day the wooden hand is still paraded. The Legionnaires also drink a ceremonial coffee to remember the fact that Danjou’s men were denied this small privilege on the morning of 30 April 1863. The battle honour ‘Camerone’, embroidered on the flag of the Légion étrangère, is held in particular esteem by the Foreign Legion. The epitaph erected at the site of the battle, but since lost, recorded that: ‘They were less than sixty opposed to a whole army. Its mass crushed them. Life rather than bravery gave up these French soldiers at Camerone on 30 April 1863.’ Even if one allows for a certain license in this text, Danjou and his Legionnaires had exhibited an exceptional courage, and, more for the sake of honour than any tactical reason, they had fought on against all the odds. This entry was posted in France, Personnel by MSW. Bookmark the permalink.